6:00 PM until 7:00 PM. Drop in at War Water Brewery in St. Clair for great beer or soft drink, and theological discussion. Stop in for coffee and conversation at Neiman’s Cozy Cafe. We understand that visiting a church for the first time can be a bit uncomfortable. Hopefully our Letting you know what to expect should help a little. Our Sunday worship services include singing, responsive readings, prayers, a scripture lesson, a sermon, and (on the first Sunday of each month) Holy Communion. All people of sincere faith, regardless of religious tradition or church membership are invited to share in Holy Communion; but no one is obligated. An usher will provide you with a friendly greeting and offer you a bulletin, which contains the order of service. The bulletin will let you know when to sing, read, or stand. It will also provide you with information about what is currently happening at the church. Children remain in the sanctuary with their families until after the Children's Moment (around 10:15); they are then dismissed to attend Sunday School. (Children are also welcome to stay with their families during the entire service as well.) We provide nursery care throughout the service. Most people who attend on Sunday morning dress in "business casual" or "smart casual" attire. Some dress more formally, and others dress more informally. We invite you to come dressed in what makes you feel comfortable. 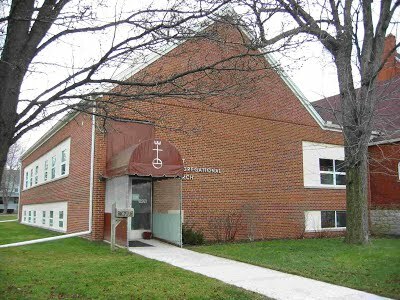 The church building is handicap accessible through the west entrance (the door with the covered awning featured in the above photo). Upon entering, we have an elevator that will take you from the basement to the main level. Handicap parking is available near this entrance. Click the Map to view parking and directions.